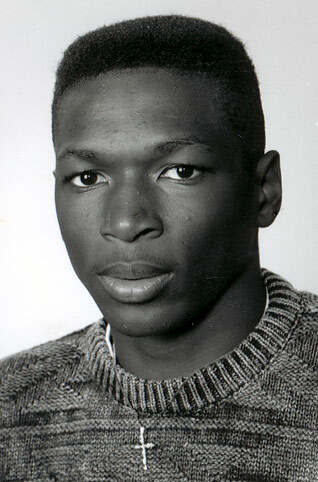 Wyoming’s all-time leading shot blocker, Theo Ratliff became one of the most-decorated big-men in Cowboy history. His total of 425 career blocks was the second best total in NCAA history behind Georgetown’s Alonzo Mourning, who finished with 453. During his senior year, he shattered a Cowboy record with 144 blocked shots, which was second in the nation that season. He also averaged nearly 15 points per game as a senior. As a sophomore in 1992-93, he led the nation in blocked shots. His school records include most blocked shots in a game, most in a season, best per-game blocked-shot average, most career blocked shots, and best career blocked-shot average. He also finished in Wyoming’s top 15 in both scoring and rebounding. In 1993, he competed for the USA Basketball team in the World Championships. He was a first-team All-Western Athletic Conference selection as a junior and a senior. He also was on the WAC All-Defensive Team for three years. After completing his great Wyoming career, Ratliff was the number one pick of the Detroit Pistons in the 1995 NBA draft. He was the 18th overall pick, and the first WAC player selected that year. He also played with the Atlanta Hawks and the Portland Trailblazers.